Few of you will know this, but a week ago, the Society for Display Information (SID) held a week-long symposium/exhibition (Display Week 2014) in San Diego. You may be unfamiliar with this particular venue, but it's actually one of the most popular display tech expo's, and, more importantly, often has representatives from leading companies showcasing novel display technologies. This year's edition was no exception. While Samsung and LG, thanks to their bendable OLED screen implementations in the Galaxy Round and the G Flex, mostly stole the show in terms of awards, some would argue that another well-known manufacturer had the most intriguing piece of tech on show. As you probably realize already, we're talking about Nokia. Developed in collaboration with Semiconductor Energy Laboratory (SEL), Nokia showcased two 5.9-inch screens (with 720 x 1280 pixel resolution) that are truly foldable, though they differ in they way you can fold them. More specifically, model number one can be folded in two -- like a book -- while the other can withstand being folded in three (see demo below). Obviously, we could speculate that the industry is now one step closer to delivering truly foldable, portable smart products, though it will obviously be a long while until such tech becomes available to your average consumer. Perhaps as importantly, at least when novel tech is concerned, there's no such thing as too much pessimism -- engineering and design difficulties (not to mention cost) often mean that otherwise extraordinarily-looking tech such as this are a fair way off from commercial release. I wouldn't be surprised about Nokia's Technology because most of the time they are the one who have the best idea's like Solar Panel Display. That's why I wan't them to be the King of Phones again in the next years or after the contract of their Mobile Division in Microsoft. im loving my note 3 but i feel like nokia is the only company that deserves to be the king. they just need to hire samsungs executives! Amazing MSNokia still continues to impress! LG and Samsung just got behind lol! 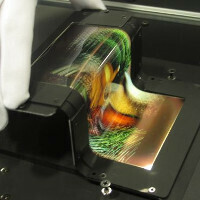 nokia was the first oem to show bendable display back in 2011, then samsung and lg follow the trend. Based on what????? where's your proof? This is what I would love to see in a smart phone. Closed, say a 4-5" phone. Open it up, it transforms into an 8-10" phone/tablet.